Local villager Alimase skis with traditional horsehide skis in the Altai Mountains in Khom village of Altay, Xinjiang Uighur Autonomous Region, China, Jan. 27, 2018. On the western edge of China, Sulita straps on his skis and heads out into a winter morning. The temperature is -30 degrees Celsius (-22 Fahrenheit). Local villager Alimase holds traditional horsehide skis in Khom village of Altay, Xinjiang Uighur Autonomous Region, China, Jan. 27, 2018. The design of skis such as the ones used by Sulita, who like many people in this region uses just one name, has barely changed for centuries. The bottoms of the skis are covered with horsehide, and shoes are tied on with leather rope. The direction of the horse hair allows the skis to slide forward, while preventing them from slipping backward when traveling uphill. "I've been up the highest mountains with these," Sulita said. "When I was young, we used the horsehide skis a lot, for hunting or if we lost a cow or sheep." 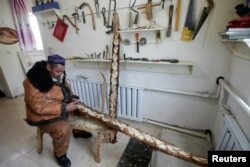 Local craftsman Slanbek, 63, makes traditional horsehide skis on the outskirts of Altay, Xinjiang Uighur Autonomous Region, China, Jan. 25, 2018. Xinjiang is a volatile region where hundreds of people have been killed in recent years in violence between Uighurs, a mostly Muslim people, and ethnic majority Han Chinese. Most of the violence, which Beijing blames on Islamist militants, has been in the far south of the region, rather than its far north. Cave paintings discovered in Altay — today home to a mixture of ethnic Tuvans and Kazakhs — show rows of figures standing on what look like skis, with herds of animals running below them. A cave containing ancient paintings that show rows of figures standing on what look like skis, with herds of animals running below them, is seen on the outskirts of Altay, Xinjiang Uighur Autonomous Region, China, Jan. 25, 2018. That would date them as much older than archaeological findings of skiing in Russia, cited by the International Ski Federation, the sport's governing body, as coming from 6,300 to 5,000 BC. "It's the earliest in the world, that's for sure," said Shan. "I've got a total of 10 pieces of evidence that can prove this." 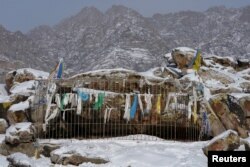 With Shan's help, the Xinjiang Uighur Autonomous Region government has organized races using traditional skis and recognizes skiing as a cultural heritage. Local villager Sulita, wearing traditional horsehide skis, makes his way home in Khom village of Altay, Xinjiang Uighur Autonomous Region, China, Jan. 27, 2018. 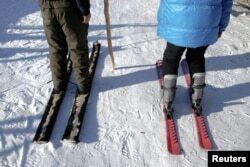 Forty minutes outside Altay city, the regional capital, Slanbek, still makes skis, but today they are just for show. "You can't hunt anymore, you can't cut down trees, so there's not much use for them," he said, referring to official bans on both practices. Instead, much of Altay has embraced modern skiing. At the General's Mountain resort, Mongolian folk-metal and Adele blast out over loudspeakers as children as young as 5 zip down the slopes. Whether the use of horsehide skis survives will depend on the younger generation in the remote villages around Khom. Bayaerta, 15, left, wearing traditional horsehide skis stands next to Mieergenku wearing modern skis, in Khom village of Altay, Xinjiang Uighur Autonomous Region, China, Jan. 27, 2018. As the sun peeks over the mountains into valleys around Khom, Namujel, 13, races on his horsehide skis against his neighbor and friend Mieergenku, 12, who is using modern skis. There's no competition, Mieergenku zooms past, the clear winner. But for Namujel it doesn't matter. "We can't just give up on the horsehair skis. We have to pass them on to the next generation," he said.